The house which we will assume to construct is already familiar to the student in detail, and we may suppose it to be erected upon a suburban lot not wholly level but with the usual variations of ground and aspect. The house is designed in the Colonial style (Fig. 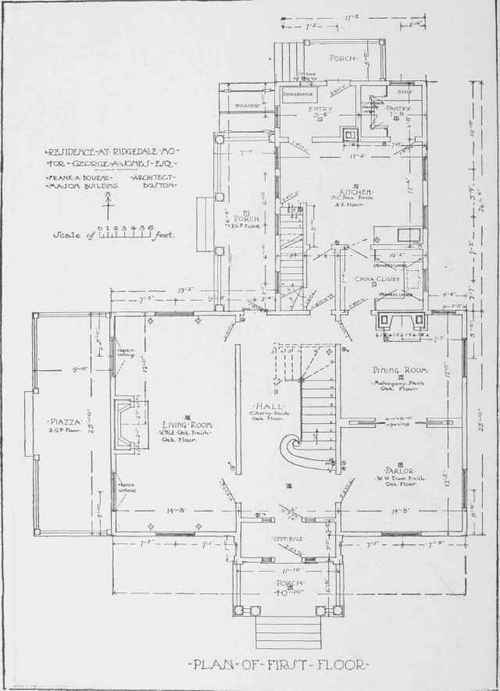 3), and comprises a large living-room, hall, parlor, dining-room, back-hall, china closet, kitchen, pantry and entry, on the first floor (Fig. 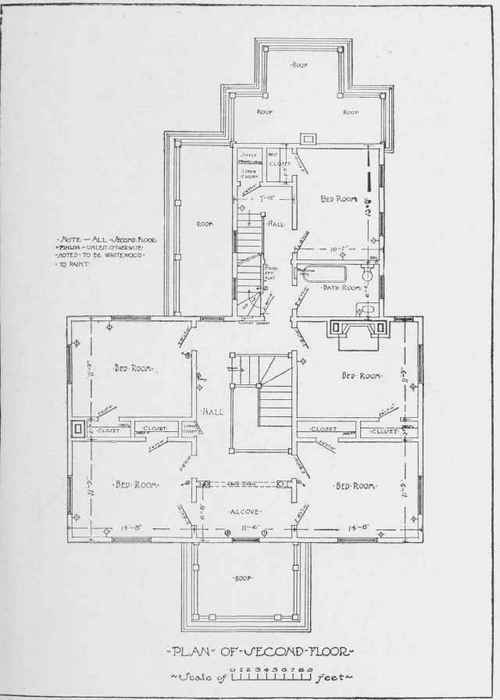 4); and five chambers and bath room with stair halls on the second floor (Fig. 5). The attic is unfinished, and the basement will contain a laundry with wash trays, a store room and. servant's water closet. The living room is finished in quartered oak, the dining-room in mahogany, the parlor, hall and sleeping rooms in white painted finish. The kitchen and service portions of the house are finished in North Carolina hard pine. The floors of main house will be of quartered oak in the first story and spruce in the second story. The floors of the service portions will be of Georgia pine. The exterior walls will be clap-boarded and the roof shingled. The drawings upon which the contracts are to be based will consist of a plan of each floor, a roof plan and elevations of all four sides. Where the inside finish is at all elaborate, sectional drawings are made in sufficient number to show all of the rooms and halls. These general drawings, supplemented later by framing drawings and details and a carefully written set of specifications, will represent the labor, materials, and methods to be employed. The necessity of a perfect familiarity with these drawings and specifications on the part of the superintendent, is obvious and has been already dwelt upon to some length, but a few words may well be noted here in regard to the same precautions on the part of the owner and of the contractor. 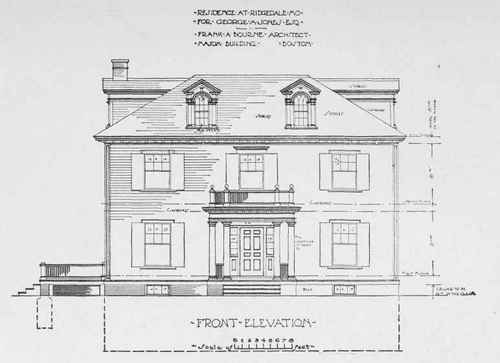 It will be to the interest of the owner, if he will take the time and trouble, while the drawings are yet being made, to consider, with the help of the architect, the various details of construction and furnishing, and to become familiar with the drawings, that he may clearly understand just what they are intended to represent. By comparing sizes of rooms, doors, stairs and other fixtures as drawn, with houses already executed, he will be able to satisfy himself that the house when done will be according to his wish. 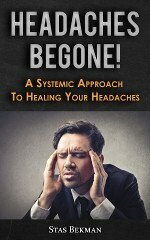 The specifications may to good advantage be studied at home where he may receive suggestions from the various members of his family, and modifications can be readily made to meet individual preferences and tastes. Careful study of this kind will be of great value to the owner, and will often avoid later expense in altering work which, in the absence of particular instruction, will have been carried out in the usual way; and the architect will find that time spent in helping the owner, and also the contractor, to a thorough understanding of his drawings, will enable him to carry out the work with greater satisfaction to himself and to all concerned. With a complete and accurate set of drawings and specifications, a fair and equitable contract, and a thorough understanding of these instruments on the part of all the parties interested, we are well equipped to begin operations at once. Upon the signing of the contract, arrangements are usually made for the architect and the contractor to meet upon the ground, to lay out the building. In our case the contractor is required by the specifications to employ a civil engineer to lay out the work and set the "batter boards". These consist of boards six or eight feet long as the case may require, securely nailed to joists which are firmly set in the ground at the corners of the cellar. (Fig. 6.) Two boards will be needed for each angle, and they are set four or five feet away from the line of the wall so as not to interfere with the excavation or laying of the cellar wall. 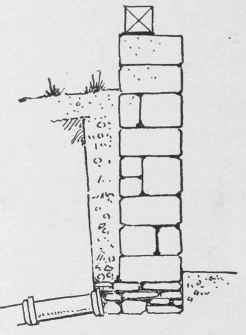 Before proceeding to erect the batters, the position of the house has been fixed by the engineer, by setting a stake at each corner, into the head of which is driven a nail marking the exact corner as given by the figured plans. This is often omitted but is advisable as it gives a figure which will correspond to the dimensions as figured on the plans, and any error can be more easily detected than when the lines for the walls are drawn. 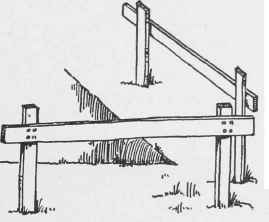 As soon as the corners of the house have been definitely located, the stakes for the batter boards are set and securely braced and upon these stakes the batter boards are nailed with the top of the board at some given level, usually the top of the cellar wall. 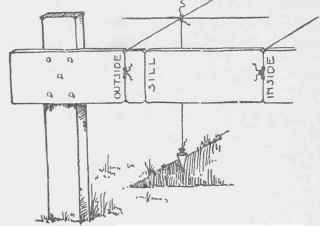 Between these boards lines are stretched coinciding with the lines of the building as given by the small stakes, and when the lines are accurately drawn notches are cut in the top of the board to hold and mark the place where the string belongs. If the stakes first put down were to represent the outside line of the sill, as is often the case, we must measure out and make a second set of notches for the underpinning and back from this line we measure the thickness of the wall. (Fig. 7.) It is often the custom to drive nails into the top of the batter boards, to which the lines are tied, but this is not a good practice, as the nails are likely to be pulled out of the board before the walls are finished, and are very likely to be driven in again in the wrong place. 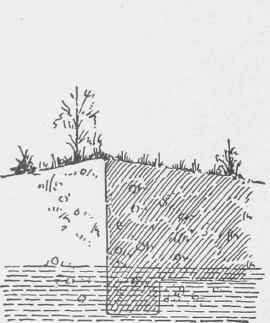 In addition to setting the batter boards at a given level, it is always well to establish in some permanent place, as upon the top of a neighboring ledge or by a stake firmly set and well out of the way of all building operations, a datum level or "bench mark", as it is commonly called, from which at any time the levels of the work may be given. Before leaving the grounds it will be well to instruct the builder where he can best deposit the material which will come from the excavations; and to place this to the best advantage, it will be necessary to determine in a general way, the position of the driveways or paths, and also to have a thought for future improvements and for the required drainage system. Unless this matter is taken up at this time it will be very probable that the earth from the cellar will be left so near the excavation that it will have to be driven or walked over during construction and finally moved away to its destined use, as it should have been at the start. The gravel will be needed for the driveways and paths and space for this should be found not far away from the house; and the loam will be used where it is desired to have a good growth of grass and flower beds, so we will have this piled at the front of the lot, taking care to leave ample space for the convenient handling of timber and other materials. It will be necessary to consult the builder in regard to this, as well as in regard to the depositing of earth, in order that he may not later complain that he has been hampered by lack of proper space at places convenient for the prosecution of his work. Fig. 7. Marking of Batter Board.